Emanuel Levinas and the Limits to Ethics highlights how radically different Jewish ethics is from Christian ethics, and the profound affinities that subsist between Jewish ethics and philosophical and political liberalism. The philosophy of Emmanuel Levinas has captured the imagination of a global constituency who take his absolutizing of ethical demands and his assigning primacy to ethics over all other branches of inquiry in his mapping of Western philosophy to be indicative of a major re-ordering of both personal and cultural identity. It is this re-ordering, they believe, that would restore greater wholeness and value to human life. 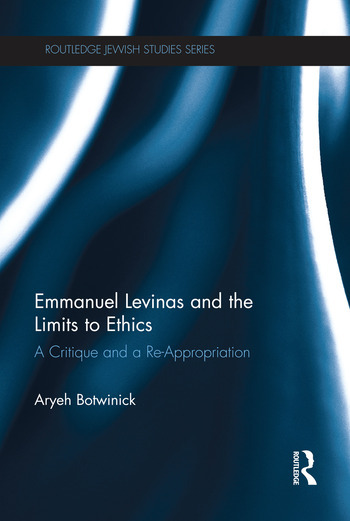 In this book, Aryeh Botwinick takes issue with both the theoretical analysis that Levinas engages in, and the practical ethical import that he draws from it. Arguing that what Levinas has to say about both skepticism and negative theology can be used to re-route his argument away from the avowed aims of his thought, this book will be of great interest to students and scholars of Jewish Studies, Ethics and Philosophy. 1 Introduction 2 The Routes to the Ethical 3 The Talmud and Liberalism 4 Theory and Ideology in Levinas 5 Levinas and his Contemporaries 6 An Ethics of Theory vs. and Ethics of Ideology 7 Nietzsche and Levinas 8 Plato and Levinas 9 Can there be an Ethics that is otherwise than Being? Aryeh Botwinick is Professor of Political Science at Temple University specializing in political theory. He studies the relationship between monotheism and skepticism considered both as a structure of argument and as an ethical content. Previous publications include Skepticism, Belief, and the Modern: Maimonides to Nietzsche (1997), and Michael Oakeshott’s Skepticism (2011).